TheBlueGuerilla: EXCLUSIVE: Notts Uni Tory Chairman Slams LSE Conservative Leader After 'Toffish' Telegraph Article. EXCLUSIVE: Notts Uni Tory Chairman Slams LSE Conservative Leader After 'Toffish' Telegraph Article. NOTTINGHAM TRENT UNIVERSITY (NTU) Conservative Future (CF) Chairman, Nadim Muslim, has been enraged by an article by LSE Conservative Chairman Josh Hitchens titled "Conservative university associations need to shed ‘toffish’ image", blasting "there is certainly no 'Bullingdon style' behaviour" at his branch, TBG can sensationally reveal. The article is set to cause an almighty row between Tories up and down the country who clearly have differing experiences when it comes to being a member of a Conservative Party Branch/Association. 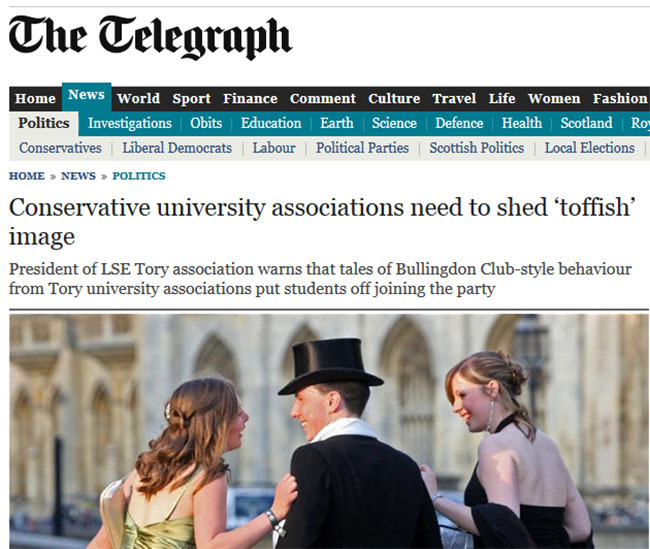 Nadim Muslim exclusively told TBG - "As I was on The Telegraph's website, I stumbled upon an article entitled 'Conservative university associations to shed 'toffish' image' written by the LSE Conservative Association President. Frankly, I find this difficult to agree with in the majority of cases. As Chairman of Nottingham Trent University Conservative Future, I can assure you that this is 'toffish' image does not exist everywhere. "At NTU CF, we pride ourselves on being open to everyone, irrespective of gender or ethnicity, as is touched upon in the aforementioned article. Our events are popular, reasonably priced for students, and we choose Pint and Policy over Port and Policy, where there is certainly no 'Bullingdon style' behaviour. Travelling the country to see other Conservative Future branches at universities, I can tell you that such behaviour is seldom seen. "This is a great time to be a member of Conservative Future at university and support for Conservatives at university levels is on the up. "It is disgraceful that it gained such attention when it simply not true. I'll be reassuring members this isn't the case." They are definitely toffs at Uni of Notts CA. I've been to meetings with people in tweed blazers and extremely posh, toff accents. It definitely doesn't resonate with normal people. Don't we all lap up the 'toff' thing anyway, even though none of us actually are?! As in, NONE.